Muslims love to ask Christians this question because it seems like the perfect trap. Christian: Of course God cannot die. Muslims: So Jesus is not God! Very simplistic reasoning and a very flawed one. Let’s think about it for a minute and see why this argument does not work. First of all, we can all agree that God is eternal and infinite. He is the beginning and the end. He cannot die. Who can die? Human beings, of course. But what is dying? Does dying mean ceasing to exist? When you die, do you disappear? No. Dying is just the end of your existence as a human being on earth. Only your earthly body is no more but you still live on in your spiritual form in either heaven or hell. So when Jesus died, what happened? His existence as a human being on earth came to end. The human body that the Word of God took on, 33 years earlier, was killed. You see, the eternal Word of God who is divine, added to Himself an earthly, weak, human body which is not eternal, which is not infinite, but can die. In other words, a weak human nature was added to His eternal divine nature. This is called the Hypostatic union. He never lost His divine nature when He took on a human nature. Read the rest of John 8. You will see that Jesus goes on to say that He existed before Abraham. Not only that, He claimed God’s name, YHWH, for Himself. Can God die? No, He is eternal. 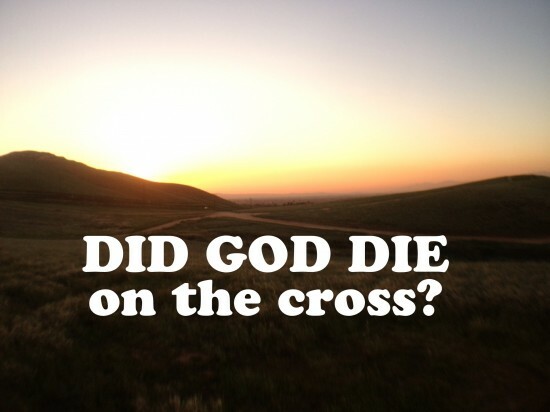 Did Jesus die? Yes, YHWH’s existence as a human being on earth came to end. Did Jesus Claim Equality With God? Can Someone Else Take Your Punishment? Word Of God or words of God? Who Did God Appear To? Was King Solomon a Muslim?